A United States Magistrate Judge has set a trial date for an unprecedented climate change lawsuit brought against the federal government by a group of US youth. Juliana v. United States will commence on February 5, 2018, and will allow 21 plaintiffs aged 9 to 20 to argue that their rights have been breached by US government action to promote fossil fuel use. The suit asks that the court orders federal government to prepare and implement a plan to phase out fossil fuel emissions and draw down atmospheric CO2. It is worth noting that this lawsuit was initiated back in 2015 against the Obama administration, but will now be defended by the Trump administration. It will be interesting to see how the current administration strategises its defence. We understand some advice has gone to Ministers regarding the ETS review while officials continue to work on more detailed accounting rules. It is unlikely we will hear any announcements this side of the election, and any changes to the ETS will likely come into effect next year at the earliest. Hydro lakes in the South Island continue to operate at low inflow levels. This could keep pressure on thermal generation as we head into the depths of winter, so we may see more demand for NZUs from these emitters. Recent snow dumps may help to ease this situation, but the physical impact could be some time away. For most of June prices hovered around the $16.40 mark, until a rapid rise at the end of the month saw prices rally $0.80c in 9 days to end the month at $17.20. The upward trend has continued into this month, with trades being settled at $17.85 on 13th July. 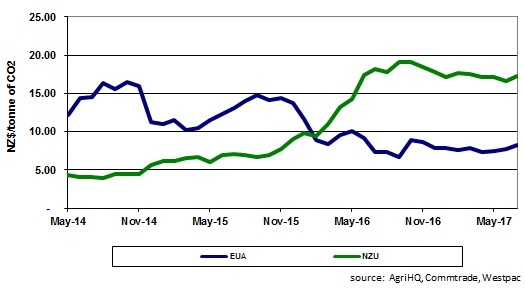 The figure below shows the recent carbon credit prices for EUAs and NZUs. Note that from 1st June 2015 only NZUs or New Zealand AAUs are valid units in the NZ ETS. EUAs are valid units for trading within the European Union.